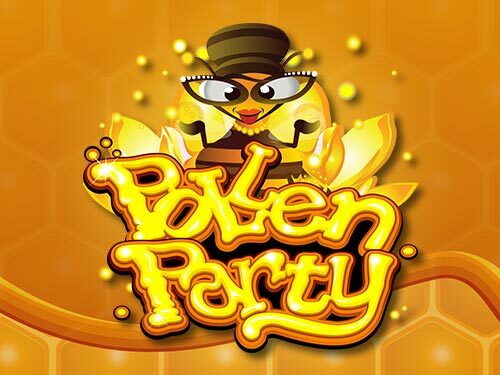 The Fortune Lounge casinos bring you a new and exciting game, Pollen Party during the month of March. This slot is the first from the leading online game developer, Microgaming that brings you 720 Ways-To-Win! This can only mean that you have bigger and better chances of winning, and it comes with its own unique character and feel. You will spin on the sweet honeycomb reels besides honey bee highs and detectable lows and also get a chance to trigger the bonus feature. Pollen Party offers 2 amazing bonus features, with 2 different buzzing Scatter symbols. These features are: The Free Spins feature, full of Wild potential and another great feature where you can pick your cash prize in the Babee Bonus! Join the worker bees in the sweetest party yet, with vibrant colours and lively upbeat music. Reels 1 and 5 contain 3 high symbols, reels 2 and 4 contain 4 high symbols and Reel 3 contains 5 high symbols. Play with a minimum of 0,01 coins for winnings up to 110,000 coins! When you land 3 or more Bonus Scatter symbols anywhere on the reels (which is a symbol of a pink queen bee), you will automatically trigger the Babee Bonus feature. In this feature, you will be given the opportunity to pick between 20 honeycombs with 17 cash prizes, 2 pop items and 1 Babee Pop-blocker. Wins from this bonus feature are multiplied by the initial bet and the Babee feature cannot be triggered during the Free Spins feature. Land 3 or more Scatter symbols and you will be automatically awarded with 12 Free Spins. When you land a Special Wild on the centre reel, it will replace up to 3 Wilds on the reels. All the bets and lines played will be determined by the initial bet that triggered the Free Spin. Pollen Party also buzzes with the Wild symbol which substitutes any symbol on the reels except the Scatter symbol. The Scatter symbol wins add to Ways-To-Win. They are multiplied by the total bet and also pay in any position! Go ahead and join any of the Fortune Lounge casinos (Royal Vegas, Euro Palace, Vegas Palms, 7Sultans, Platinum Play, Red Flush or Casino La Vida), and play this honey-coated slot for some sweet winnings. Every of these casinos offers free spins, free money and sometimes, no deposit bonuses!